Tell us how we can help you. We’re always ready to listen. We want you to love our products. We want you to be crazy about them. We want them to make your day-to-day vaping so exciting you'll be blown away consistently. And because of this, we offer a 30-Day Money Back Guarantee (on VaporFi Branded items purchased through this website) in the sad event that you're not thrilled. Your satisfaction is what we're aiming for, so if we can help get you there, let us know what we can do. Otherwise, if you're not satisfied with our awesome products, you are free to return them for a full refund of the purchase price (not including shipping and handling and excluding e-liquids and products manufactured by brands other than VaporFi). To get things done as smoothly as possibly, call our customer service department at 1-855-938-2767 and our cheerful customer service reps will provide you with an ultra-necessary RMA number. In any event, we will do our very best to provide the highest quality electronic cigarettes on the market, provide the very best customer service, and always ensure our shipping is lightning fast. Your business is immensely valuable to us, and your satisfaction means everything! PLEASE NOTE: Online purchases cannot be returned at one of our stores. Refunds MUST include a valid RMA number, must be received within a 30-day period from the original order date, and they must include all of the items from the original purchase. However, we reserve the right to deny any refund, as well as hold the right to issue a partial refund in the event that any request fails to meet aforementioned requirements. For obvious, potentially health-related reasons, we cannot offer this guarantee on e-liquids. Free domestic shipping on all U.S. orders! Every day! Shipping done right is what you can expect from us. We boast a fast processing time, as well as a fast turnaround. No one likes wasting time, so we don't want to waste yours as you eagerly await your vapor goods. Orders are usually shipped the same day if placed by 12PM EST (with the exception of weekends and holidays). Unless you opt for expedited shipping, 5-7 days is the norm for delivery. For shipments to AK and HI, shipping can take up to 2 weeks. We love communicating with you, and as soon as your order is placed you can expect an email from us confirming it. The same goes for when your order ships, you'll receive another emailing containing tracking information as well as anything else that may be pertinent to your order. VaporFi is pleased to ship worldwide, however let it be known that international shipments can take between 7 to 45 business days for arrival, depending on the country. At the customer's request, we are more than obliged to ship anywhere, though we will not take responsibility for packages that may become seized by customs. We are a law-abiding company, and we always adhere to the laws of the countries we physically operate in, but it remains the customer's responsibility to be aware of the laws, duties, taxes and currency exchange rates in their residential country. We know you want to know about the progress of your order ASAP, so once the order is complete a confirmation email will be sent to you. Then when your order ships, we'll send another letting you know, and it will include your tracking number, if applicable. If you created a VaporFi account during checkout, or previously, you will be able to check the status of your order anytime you feel like it by clicking on the LOGIN link at the navigation bar located at the top of every website page. Once in, every aspect of your order will be there for your viewing pleasure. Please allot us 24 hours for the tracking information to be displayed. All domestic orders are shipped with traceable Delivery Confirmation service. If your order has not arrived within an appropriate measure of time, please call our customer service at 1-855-938-2767 so that we may begin to investigate the circumstances and issue a replacement shipment should it be necessary. 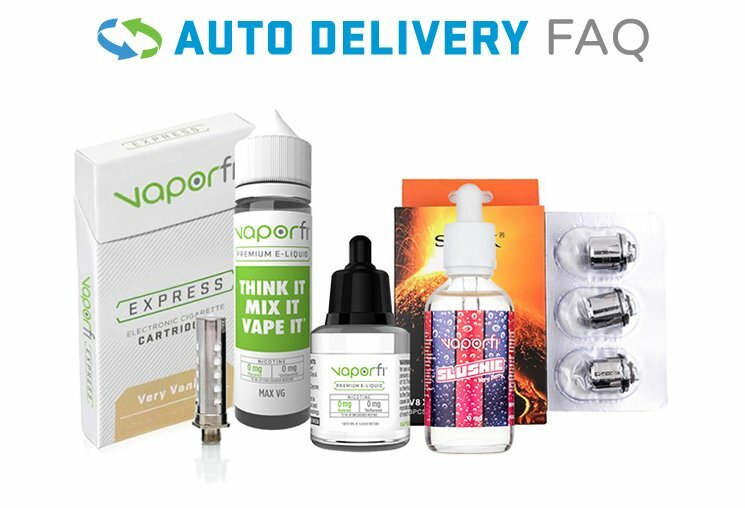 How Does the VaporFi Home Delivery Program Work? The convenience of automatic deliveries for all of your necessary refills. 5% off today's purchase & all future purchases. The ability to customize the program; you set the frequency and amount of refills you want. Members-only offers and sales exclusive to those who are active. Signing up is beyond easy; it takes just a minute, and can be done HERE. We generally respond to email inquiries within 24 hours (excluding weekends and holidays). If you require inmediate assistance, please call our customer service department at 1-855-938-2767.